All the willow that wasn’t coppiced back in February is now covered with pretty furry buds. Cut long stems and put them in a tall base for a dramatic Spring display that lasts a long time. Eventually your stems will sprout roots in the vase! I peeled all the bark off the White Willow cuttings Salix alba, cut the strips into pieces and dried them. It will make an excellent pain relieving tea or an ointment. Willow naturally contains salicylic acid which is basically what aspirin is except that it doesn’t cause stomach upsets nor does it thin the blood in the same way. 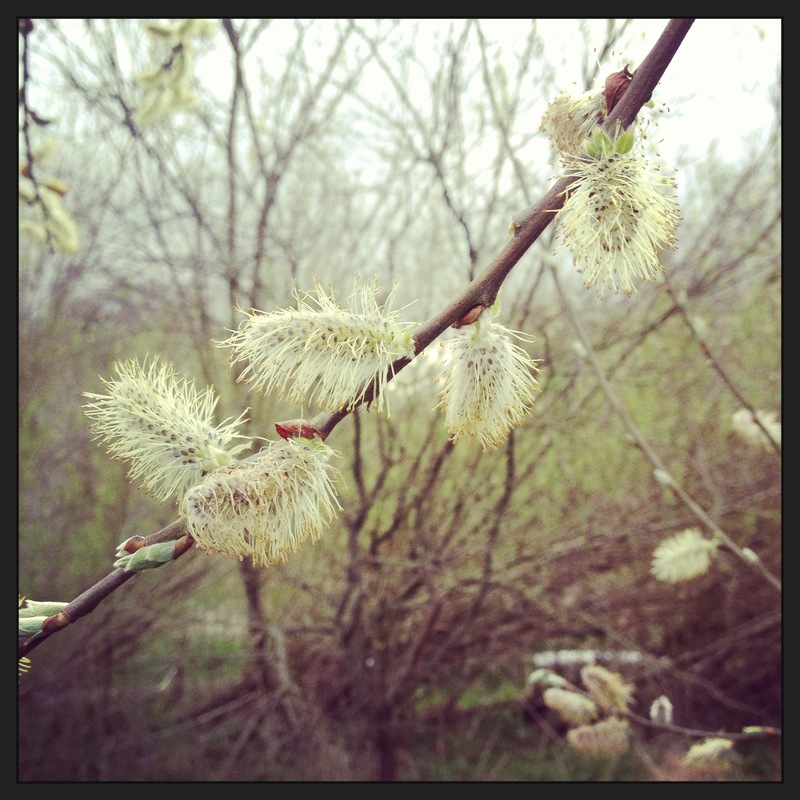 You can eat willow catkins, but don’t eat more than 12 at any one time. If you eat more than that you may experience mild nausea or tinnitus (a ringing in your ears) as a side effect. Don’t forget that natural aspirin takes a little longer to work! You can also strip the inner bark off your coppiced twig and branches and dry it, storing it in a cool dark place. To make a willow bark tea, simmer 1 to 2 teaspoons of chopped bark per cup of water (8oz or 250ml), for 15 minutes. Take it off the heat and leave it to infuse for an hour. Strain and warm it a little, then drink, flavouring with honey or lemon if you wish. You can take 3 to 4 cups a day of this. At work we use willow bark in medicine for arthritis, backache and joint pain. Our Napiers Joint Ability Herbal Remedy contains 1000 mg of White Willow 1:1 fluid extract per 5 ml dose. (It also contains the vulnerary Yarrow, anti rheumatic and antispasmodic Black Cohosh and Scullcap and a good amount of the liver herb, detoxifying Burdock root.) These 1:1 extract are high strength so are much more effective than home teas. You really can’t say enough good things about white willow bark extract! Natures side effect free aspirin!